Purchase long sticky notes custom printed with graphics or logos. Who said that recycled paper has to look like recycled paper? 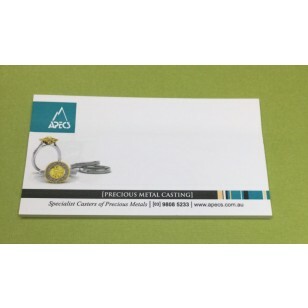 These attractive sticky note pads are made from 100% recycled paper and come in a larger size, measured at 200mm x 75mm to provide maximum writing space and extended uses. These environmentally-friendly sticky note pads make wonderful giveaways, especially when branded with your company logo or mission. The distinct and larger size of these sticky note pads provides plenty of room for images of your company's products as well. We do, however, recommend limiting the imprint area to no larger than 50% of the page for maximum writing space for the end-user. Hand them out at trade shows, conventions, or on National Green Day. The functionality and organizational uses for sticky note pads are endless: they are great for jotting down important reminders, transcribing class notes, or when writing up shopping lists. They make wonderful writing tablets that can be given out at conferences or seminars. They are sure to drive traffic to your booth and effectively advertise your business, your products, and your company's forward-thinking philosophy. Customers and prospective customers will keep them on hand, providing your company extended advertising reach. The sticky notes pads contain 40 sheets of paper that can be printed on, a backing paper as the last page, and an adhesive strip that can be positioned on any one side of the sticky note pad. The price includes the cost of the one-colour print customization, but does not include GST. Printing is done in Australia and product(s) can only be delivered to customers within Australia.